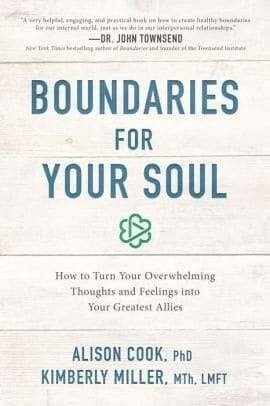 Alison Cook and Kimberly Miller recently co-authored Boundaries for Your Soul: How to Turn Overwhelming Thoughts and Feelings into Your Greatest Allies. Alison earned an MA in counseling from Denver Seminary and a PhD in religion/psychology from the University of Denver. Kimberly Miller earned master’s degrees from Regent College (theology) and Azusa Pacific (clinical psychology). In Boundaries for Your Soul, Alison and Kim show how to work with the conflicted aspects of yourself. In doing so, they interpret the Internal Family Systems (IFS) model through a Christian lens. Also, through this process you learn to understand, and even befriend, the hurting parts of your soul. 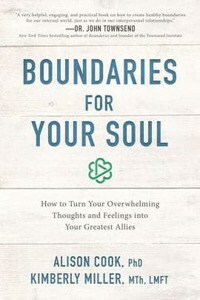 As a result, you establish healthy boundaries with different parts of your soul vying for control. However, to lead struggling soul parts, you must focus on them and befriend them. Then, once you invite Jesus to draw near, unburden those emotions and integrate them with the other parts of your soul. The authors refer to this five-step process as taking a You-Turn. As you journey on your path to peace and wholeness, you move from seeing these undesirable inclinations as problems to viewing them as allies. Since it’s impossible to rid yourself of your soul’s parts, instead help them to grow, heal, and discover their God-given roles. And, so your (Holy) Spirit-led self leads those parts of yourself with love, welcome your unwanted thoughts and feelings as valued members of your internal family. Therefore, the first step in taking a You-Turn consists of a focus on the part of your soul bothering you. It’s presenting itself for healing. Next, get curious about it. And, as you create space from your pain, you comfort yourself. Once you’ve differentiated from a part, you find yourself able to speak on behalf of that part, rather than from that part. That, in turn, enables you to extend grace not only to external enemies, but also to your perceived enemies within. For God wants to do something beneficial with every part of you. Hence, Alison and Kim exhort, don’t leave unwanted thoughts and feelings at the door when you spend time with Jesus. For in the presence of your Spirit-led self, a hurting part of your soul finds relief as it lays down its burdens. Furthermore, as you draw new boundary lines, you join in expanding God’s reign – within your internal terrain. When you integrate the warring parts of your soul, you lighten your load. Because you’ve eased your burden, you now notice holy reframes in your thinking. And those holy reframes free you to focus on your God-given purpose in this world. Through setting boundaries for your soul, your restore peace and reconcile the adversarial members of your soul. Remember, the authors exhort, Jesus invites every part of you- no matter how broken or rejected – to come to Him.